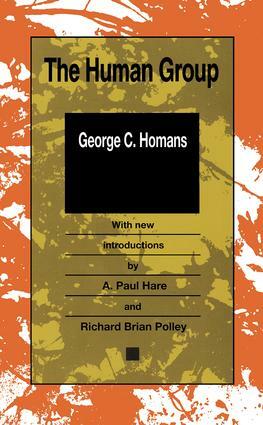 George C. Homans's classic volume The Human Group was among the first to study the small group as a microcosm of society. It introduced a method of analysis and a set of influential theories that cut across areas of specialization on the personality, community, and industry.The study of even the smallest groups is extremely complex, with the simplest associations involving an abundance of actions, relationships, emotions, motives, ideas, and beliefs. Homans concentrates on certain activities and processes he observes in five carefully selected and differentiated case studies and from them draws common patterns and ideas that serve as the bases of testable propositions.He divides his cases into static and dynamic groups. In all five cases, Homans selects comparable phenomena for analysis with a contextually different emphasis and elaboration each time. His results demonstrate that, different as these groups are, their behavior reveals fundamental similarities and social uniformities. A ground-breaking and authoritative work when it was first published in 1950, The Human Group continues to Inform and invigorate the study of small groups in sociology, psychology, management, and organizations.